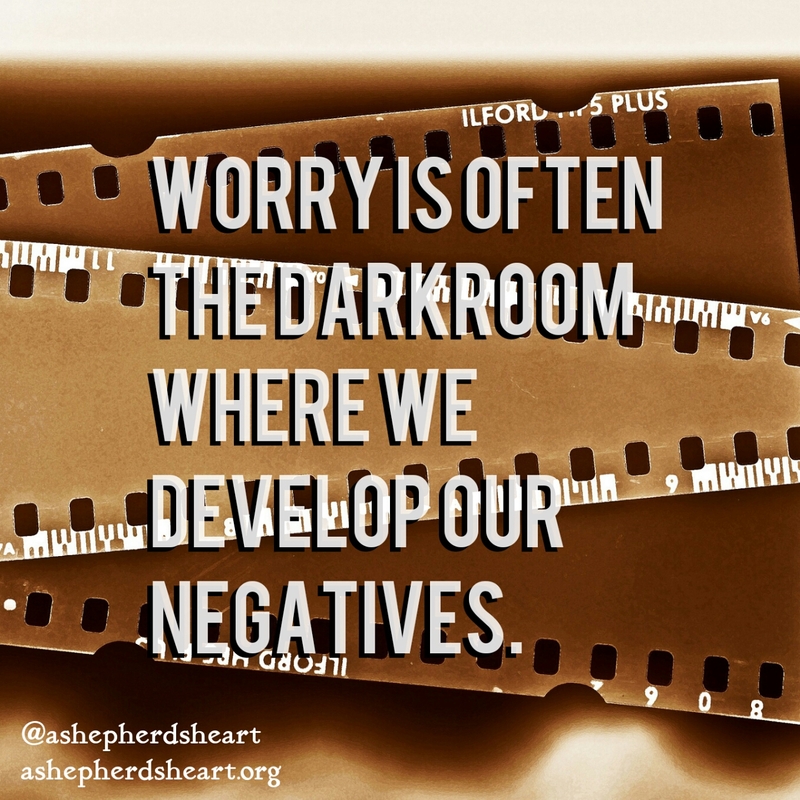 A Shepherd's Heart: Stay Out of Your Dark Room: Advice on dealing with Worry, Anxiety and Fear. Stay Out of Your Dark Room: Advice on dealing with Worry, Anxiety and Fear. You may be old enough to remember (or if too you're young, Google it ☺), there was a time that predated all things digital. Like film vs. digital pictures and many other "analog" vs."digital" technology. Cameras weren't a part of phones and instead of digital, they were stand-a-lone all film devices much like the digital camera cousins today. As a kid, I recall taking pictures via rolls of film. When I was done snapping pics, I'd take the film to the local photo developing place at a given store. I'd wait a couple days to a week for the film to be developed from the negatives and then go back, pick up the photos to enjoy the shot of the memories I captured. Before the film development automation via machines, which are essentially an automated dark room, film was developed via an actual dark room. A room setup with just the right level of light, low light, in order to take the negatives and develop them via the correct chemicals into physical photos much like how you can print out photos via digital pictures. You had to use the dark room to develop the film but that's all the dark room was for. Sometimes, the film would come back and some of the negatives didn't yield any pictures...the were a waste of time as they didn't develop. When assessing some stresses and pain points with changes in the organization as well as day-to-day stresses, I recall a co-worker and friend state on multiple occasions, "Stay out of your dark room". It's a phrase that has stuck with me in recent days as I evaluate worry, anxiety and fear in my own life. Their meaning was to not allow negative things to develop. Stop processing speculations or what "might" be. Don't allow your thoughts to become negative and develop into a false narrative. Stick to the the facts. 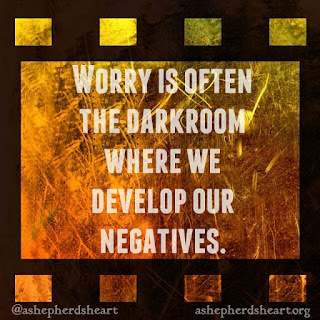 The reality is that our thoughts can sometimes develop into worry, anxiety and fear. Which can be all consuming...if we allow them to be. 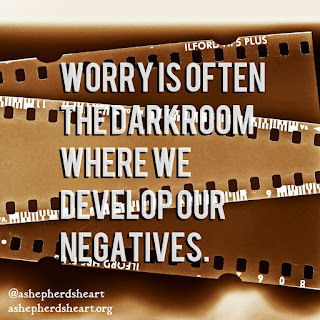 Worry, anxiety and fear are real factors but don't allow yourself to go to your "dark room", allowing your mind to concoct a story or false narrative that isn't reality. Don't allow yourself to lose sleep over things that are not and may never be. If you dwell on the "what ifs" or dwell on the negative things in life this is exactly what will happen and you know it's not a fun or productive place to be. You and I seriously need to stop it because it negatively effects our quality of life and sometimes the lives of others around us, plus, it's not God's desire for us to be consumed by these things! 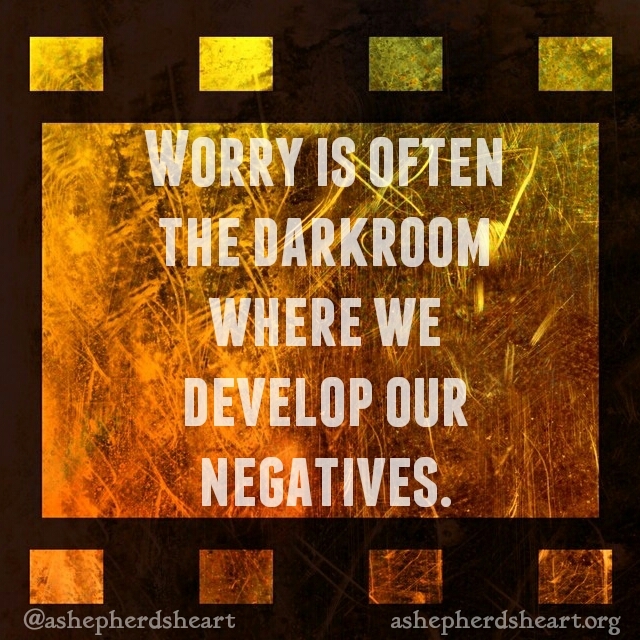 Negativity, especially through worry, fear and anxiety also cloud our vision and minds. ...Not live in Fear or we're supposed to Fear not! ...Be anxious for nothing or about anything! What if we practiced what God instructed us to do with worry, anxiety, fear and the like? I think if we did, our lives would be far different than they are today sometimes...especially the times where we allow worry, anxiety and fear to take root. Let's pray for one another that we can start operating with faith based on the truth of God's Word instead of worry, anxiety and fear. Let's take proactive steps starting now to actually give all our worry, anxiety and fear to the Lord because He loves you and I and is waiting us to do exactly what He instructs us to do! He truly knows what's best for us and He loves us so much He's given us wisdom from His Word to live even more successfully in this life He's given us and to become even more useful to Him! In Sum, stay out of your dark room my friend...step into His Light instead!